PHILADELPHIA (AP) — Keychains, rosaries, T-shirts and even a miniature plush doll of Pope Francis will be among the souvenirs for sale to commemorate the pontiff’s upcoming trip to Philadelphia. Officials on Monday gave the public a peek at some of the keepsakes to be sold online starting this month. More than 200 items will be available, with prices ranging from $5 to $500. The pope plans to visit Philadelphia in September for the World Meeting of Families, an international gathering for Catholics focused on strengthening family bonds. Much of the memorabilia— such as cups, glasses and apparel — will bear the World Meeting logo, which incorporates family figures into a Liberty Bell shape topped with a cross. Some items are playful, like the shirt that says “I (love) Pope Francis” with a miter in place of a heart. 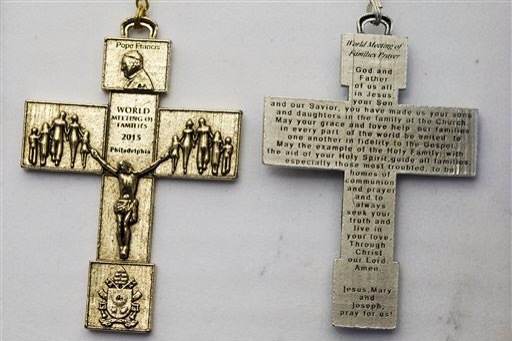 Faith-based products include rosaries and holy medals. The merchandise will be distributed by Aramark, a food and facilities management company based in Philadelphia, with some proceeds benefiting the local World Meeting organizing committee. Although initially available online only, souvenirs will be sold at retail sites during the convocation. The pope plans to attend the closing festival of the World Meeting on Sept. 26. The next day, he will celebrate an outdoor Mass that more than 1.5 million pilgrims are expected to attend. Before Philadelphia, Francis will visit Washington and New York. Tags: Philadelphia, T-shirts. Bookmark the permalink.